This seems like a pretty ridiculous question but is not at all improbable, thanks to the La Chalupa Laboratory for sharing their facilities with the outside world by creating the Jules’ Undersea Lodge. For the first time in history an authentic underwater research habitat is open to the average person. I came across this recently and couldn’t believe I’d never heard of it before. A few of us here are certified divers and always on the lookout for a new dive site. The best part about this site? It’s a once in a lifetime experience that you don’t have to travel half way around the world to get to as it rests practically in our own boating backyard of Key Largo, FL. Here’s a little info about the Lodge: To enter, one must scuba dive 21 feet to an opening in the bottom of the habitat, which sits on legs approximately five feet off the bottom of the protected lagoon. The Lodge is filled with compressed air, which prevents the water from rising and flooding the rooms. The rooms are monitored 24 hours a day and have multiple support and back-ups systems to insure guests’ safety. This is not a gimmick and seems to have a very authentic-kind of atmosphere. The initial purpose of La Chalupa research laboratory was to explore the continental shelf off the coast of Puerto Rico. The mangrove lagoon (where Jules’ is located) is a natural nursery area for many reef fish. Tropical angelfish, parrotfish, barracuda, and snappers peek in the windows of the habitat, while anemones, sponges, oysters and feather duster worms seem to cover every inch of this underwater world. 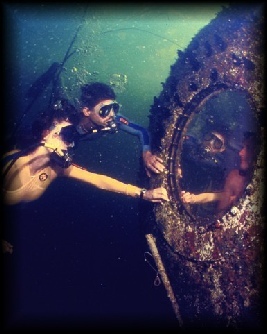 Jules’ Undersea Lodge serves as an artificial reef, providing shelter for marine animals. For all you divers out there, this is definitely one to add to your bucket list! remarkable reading for any person who enjoys this sort of stuff. I know that I certainly do.